Finally after the “winter that would never end” the forecast predicted a decent weekend. Temperatures would start out cold, but would rise into the mid 50s and it would be sunny. I fanatically checked and re-checked the weather forecast leading up to the weekend looking for any change and praying that the good weather would hold – it did. I decided to take a later start time to allow the temperature to warm a little. That would also allow me to hike during more of the warmer temperatures. After loading my gear into my car I set my navigation for the trailhead; over two hours away. As I began backing out of my driveway I remembered I had forgotten to grab my hand-written list of the access points and distances between. I ran back in the house and found I had also forgotten my GPS unit. After ensuring I had everything, I got back in my car and started on the long road trip to the west. The drive was uneventful. I stopped for gas in Bath and then got back on the road. Finally I arrived at the little farm road called Kennedy Road. I pulled onto the small dirt track, did a quick K-turn, and pulled off onto the shoulder. The air was chilly, it was only 32, but the sun was shining brightly. I pulled on my boots and hoisted my pack to my shoulders. My GPS unit normally clips onto the waist strap, but I had misplaced the clip, so I stuffed the unit into the front pocket of my sweatshirt. I also started the track recording on a new app I had installed on my phone, GPX Viewer Pro. After all of my gear and gadgets were settled I started my walk along the little farm road heading away from RT 70 (mile 0.0 – 8:57 am). A short distance down the road I came to a double set of railroad tracks. 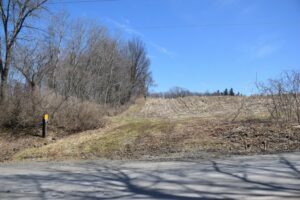 I stopped to take a few pictures of the road, tracks, and a small stream that ran nearby before crossing and continuing on toward the farm. 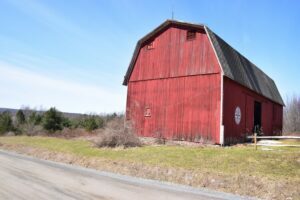 As I approached the farm I came upon a warning sign posted by the state police, “These premises have been placed under supervision of State Police Patrols. All persons are hereby warned against trespassing or committing crimes or nuisances on this property”. I wondered about the sign, but the trail clearly continued across the property. The trail took me to the left around an old barn that was beginning to fall in on itself. 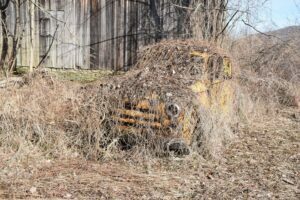 I discovered an old yellow pickup truck that could barely be seen because of all the vines that had grown over it. 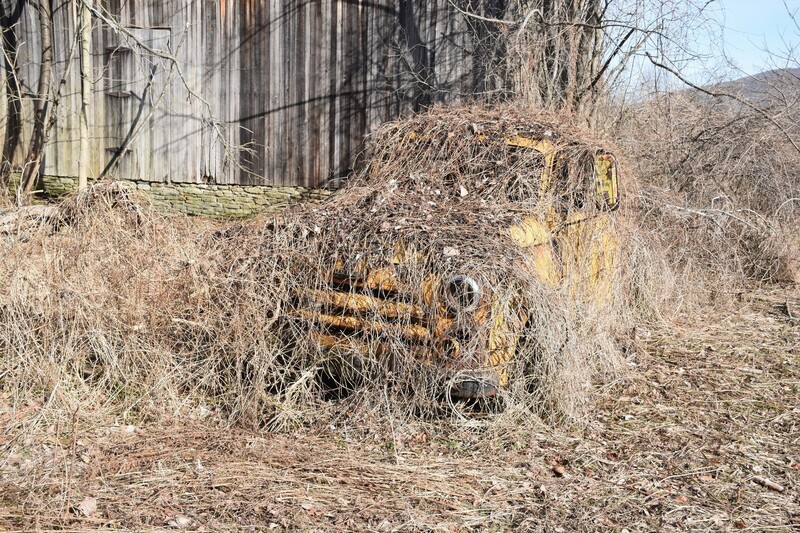 Had it been later in the year once the vines had leafed out I probably would not have seen the truck. I continued on around behind the barn and into the woods passing several other old and rusting pieces of farm equipment. The trail began a climb up the hill and over the next half mile I ascended over 400 feet. After the quick climb the trail turned to the right and began to follow along the side of the hill. Snow powdered the ground in many places still, but was little more than a thin layer. 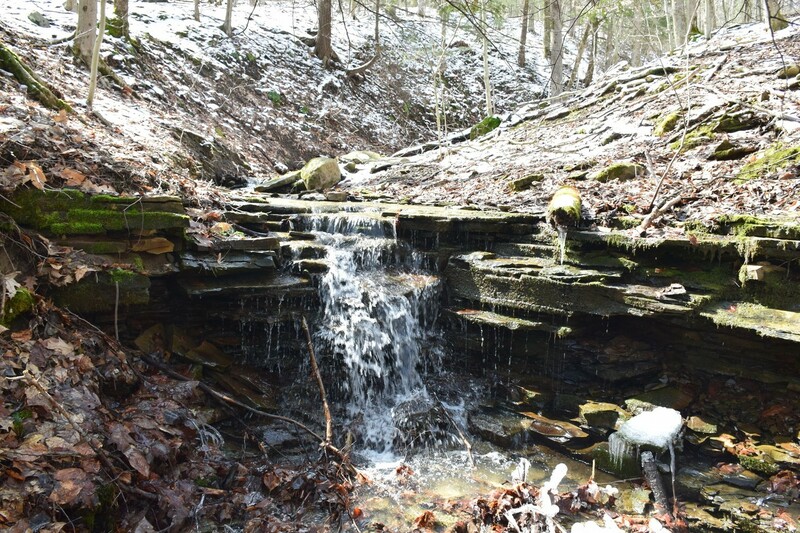 I continued along the side of the hill and came to a small stream which I easily stepped across. A short distance later I came to another, and then another, and still another. Most were small and had only dug a small gully into the hill forcing me to descend a few steps, cross the stream, and then climb back up a few steps on the other side. Near several of the streams I saw wild turkey that scrambled quickly out of sight. I came to a much deeper gully and stopped at the top looking at how best to pick my way down. The snow was thicker around this gully because it was deeper and more shaded. The slope down to the bottom was steep and treacherous. I slowly made my way down the steep bank, sliding a few times, but bracing myself with my walking stick. Finally I arrived at the bottom and I stopped to take some pictures of the little stream and the steep climb I had just come down (mile 1.6 – 9:48 am). While I was taking pictures I noticed that the clip for my GPS unit was attached to a pocket on my camera bag. I transferred the clip over to the waist belt and hooked the unit in place. The readings on the unit were off, perhaps due to being in my sweatshirt pocket, but my phone app was recording correctly. I began the steep climb up the other side grabbing trees and using my walking stick to pull myself up. Finally I reached the top and continued my journey. The trail crossed more gullies, none quite as deep as the one I had just left, but still deep enough to make the trek difficult. 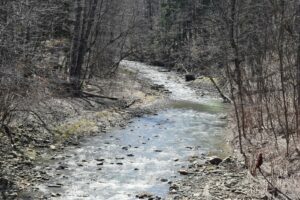 I was not sure how many streams I had crossed, but I suspected as many as a dozen; I would have to count on my return trip. The trail turned onto a rough dirt-track that might have been used for logging vehicles. I neared another stream and gully, but the dirt-track had a bridge taking it over the stream. A trail register was posted on a tree a few feet before the bridge, and I stopped to sign in (mile 2.1 – 10:05 am). After leaving the register behind I began a small climb up to Delude Hill Road. I quickly crossed the dirt road, more mud than dirt, and climbed up the bank on the other side. 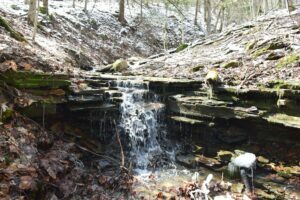 The trail continued along the side of the hill and I came to a few more small streams and gullies. One stream had a small little waterfall and I stopped for a few pictures (mile 3.0 – 10:34 am). The trail turned and began to descend a little. Not long after I came to the edge of a field. Perhaps a dozen deer were on the other side and they took flight. 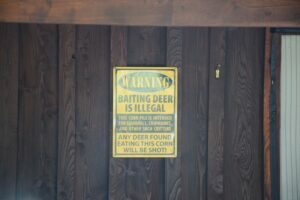 A few feet further down the trail were two hunting cabins and next to them a pavilion with a picnic table. The white blazes of the trail led me directly past the front of the cabins. One of the cabins had a sign posted on the front that caused me to chuckle. Just beyond the cabins another trail register was posted to a tree (mile 3.4 – 10:51 am). I stopped and signed in here as well. After leaving the register and cabins behind the trail turned once again and began to climb. After a short climb it began to level out and turned into an old overgrown field. The ground was wet and muddy and I picked my way along and arrived at Fox Hill Road (mile 4.3 – 11:21 am). 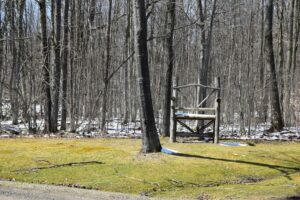 The first thing I noticed upon arriving at the road was the huge wooden chair that sat in the yard of the house across from the trail. I stopped and took a few pictures of the chair. Someone had spent some time to build such a massive thing. I turned right onto Fox Hill Road and started a long road-walk. A few yards down the road I reached down for my GPS unit and it was gone; my heart leaped into my throat with a moment of panic. Certain I had it when I arrived at the road, I turned back to search for it. I found it lying on the ground at the trailhead; panic turned to relief. Once the GPS unit was secure on my belt I started off down Fox Hill Road once again. A short walk and the road made a sharp 90-degree turn to the left. A house sat at the corner and a view opened out across the valley beyond. The road ran straight and level for a good distance and then began to descend as it curved slightly to the left. As the road began to curve back to the right I came upon a bright red barn standing against the brilliant blue sky (mile 5.4 – 11:44 am). I stopped to take a couple of pictures before continuing on down the road and around the bend. 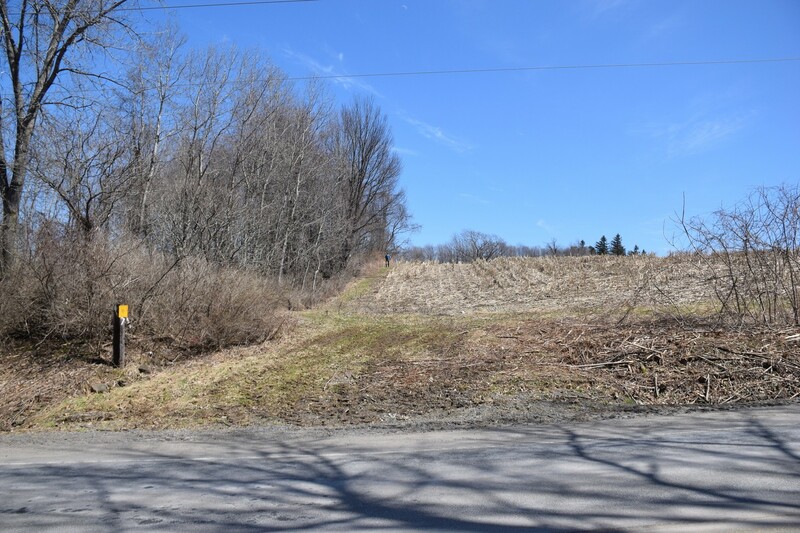 Fox Hill Road joined Dalton-Birdsall Road, a busy paved two-lane road, as it curved around. I checked for traffic before crossing to the other side and continuing on down the road. I soon came to a T-junction with Old State Road and crossed over and turned to the right. A short distance down the road I came to the trailhead (mile 6.1 – 11:58 am). The trail left the road and headed west across a corn field, the stubby remainders of the stalks cut low from last fall’s harvesting. I continued along the edge of the field until I arrived at the back and the trail entered the woods. A large pine tree stood at the corner and I decided it would be a good place for a break. I set my pack down and got some water, a snack, and a little coffee that I was carrying in a thermos (mile 6.3 – 12:13 pm). After finishing I pulled my pack on and headed down the trail once again. 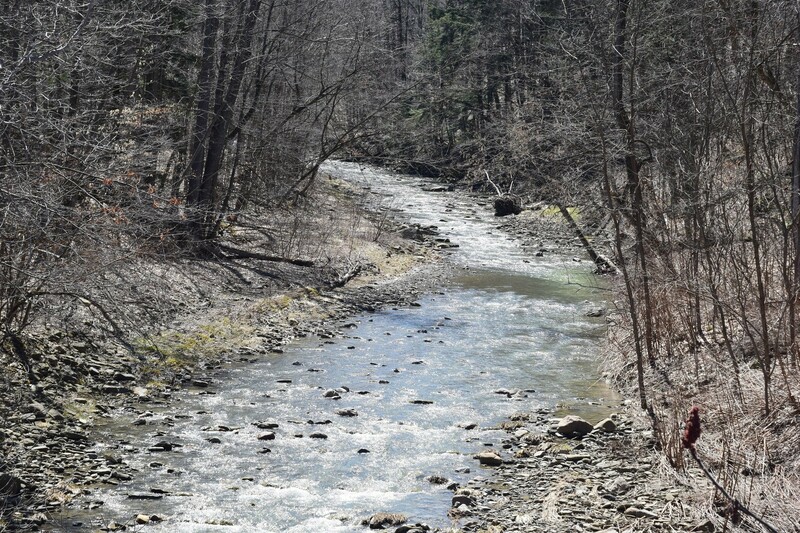 It curved down a hill and began to follow along a small stream, Keshequa Creek. A short distance later the trail headed back up the hill for a short distance and then turned back down to meet the stream once again. I had read on the FLT trail notices that this was a permanent re-route of the trail due to a wash-out. After I had descended back to the creek I looked back and could see where the trail had previously passed; it was definitely impassable. 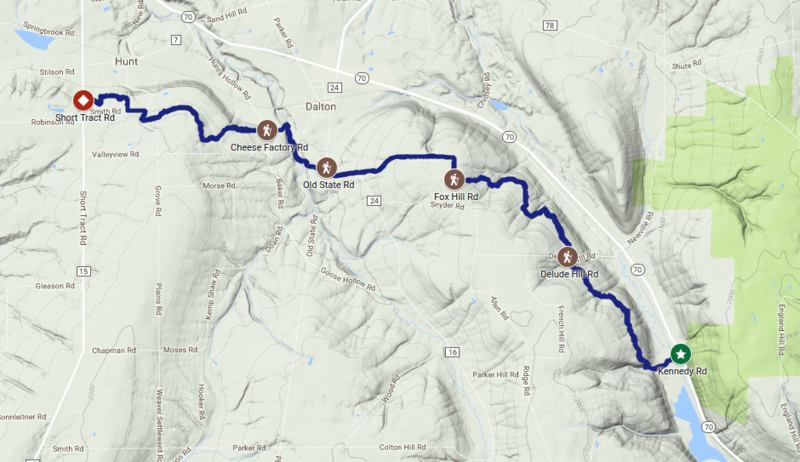 The trail continued along next to the creek and finally arrived at Cheese Factory Road; I did not see any cheese factories, let alone any other kind of factory (mile 6.8 – 12:28 pm). I turned left and crossed over a culvert that carried the creek under the road. The road made a small S-curve as it climbed and then leveled out and continued straight ahead to a T-junction with Baker Road (mile 7.1 – 12:35 pm). I crossed Baker Road, up a bank, and into the woods. Not long after I turned into a field and climbed up to Grey Road (mile 7.7 – 12:50 pm). A broad panorama opened behind me and I stopped to take several pictures before heading across the road and on into the woods. The trail continued to climb for a short distance and then opened out into another field. I stopped and looked for the next white blaze, but could not find one. Behind me I could clearly see a blaze so I knew I was in the right place. I pulled out my phone and looked at the PDF map I had saved; the trail turned right and headed along the edge of the field. A quick walk along the edge of the field and I found a faded and peeling blaze leading me down a small farm trail. I continued along the old farm trail following the faded and peeling blazes. The blazes definitely needed some touch-up and I checked the PDF a few more times just to be sure I was on the correct path. Finally I came to a bright and freshly painted blaze; it appeared that the trail maintainer was working on the blazes, but just had not finished all the way to the field. The trail began to descend and came to a deeply rutted old dirt road; water had carved a deep trench down the middle. I followed the road down and arrived at Smith Hill Road and turned right. As I walked down the road a red fox trotted across ahead of me, perhaps 30 or 40 feet away. I could not get my camera out quick enough to snap a picture and I was not able to see the fox in the woods along the road. A few yards later I arrived at an intersection with Smith Road and turned left onto that road. The road continued on straight ahead running flat between fields. As I walked along the dirt road I felt as though I was being followed. I looked back and down to my right and a farm dog had joined me. He looked to be a hound/beagle mix and he trotted along happily next to me. Hmm… a hound, a red fox… I wonder? The trail turned right off the road and headed across another field (mile 9.1 – 1:26 pm). 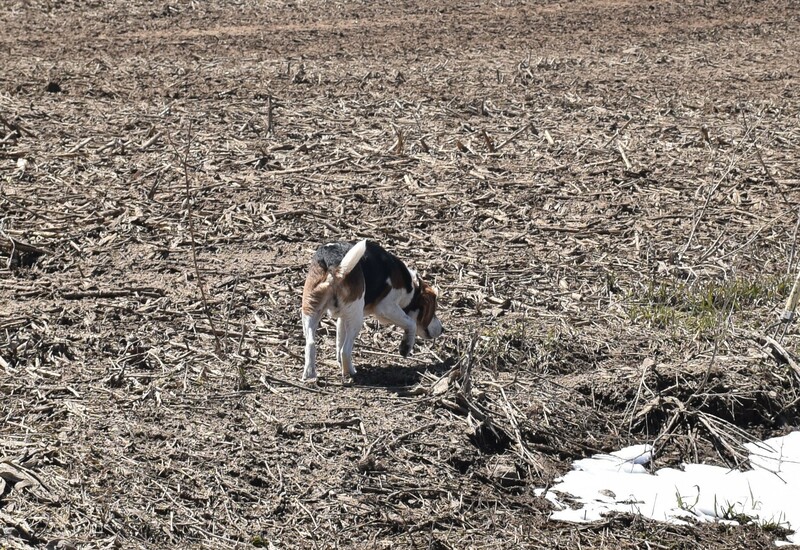 The farm dog decided to leave me to cross the field on my own. A very large tractor with massive dual wheels on each axle sat at the edge of the field. Behind the tractor a large tanker was hitched to spread liquid fertilizer. I descended down to the back of the field and then turned left to follow along the edge. It was getting late and I began looking for a good place to stop for lunch. As the trail continued along the back of the field I found a good sized rock that I could stop at and rest. I decided to wait until I was on my return trip since I was almost to my turn-around. The trail wound through a small wooded area and then across another field as it headed down to Short Tract Road. As I neared Short Tract Road I saw another hiker just crossing the road ahead of me heading toward me. He stopped and waited for me to pass. We both commented on finally being able to get out and enjoy some nice weather. A few seconds later I stepped onto Short Tract Road (mile 9.8 – 1:41 pm). After taking a few pictures I turned and started back. I arrived at the rock I had picked out earlier a few minutes later and sat down for a quick lunch. At my current pace I calculated that I would arrive back at my car after 6 pm, possibly as late as 7 pm. Sunset was at 7:45 pm, but it could start getting dark earlier if the sun fell behind a hill. I did not want to be hiking in the dark. After I finished my lunch I packed my gear and started out. As I neared Baker Road the hiker who had passed me earlier was coming back; he had reached his turn-around. 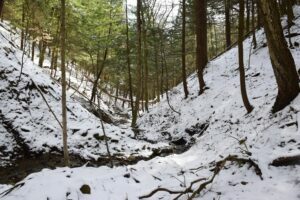 I continued on to Cheese Factory Road and down the S-curve to the creek. A house sat to the left of the curve and a woman was outside doing yard work. We said hello, commented on the nice weather, and I continued on down to the creek. I turned and followed the trail back along the creek and up around the wash-out. Soon I found myself back at the large pine tree at the corner of the field where I had stopped earlier. I decided to stop once again and take a quick break (mile 13.2 – 3:21 pm). After a short break I headed up across the field to Old State Road. 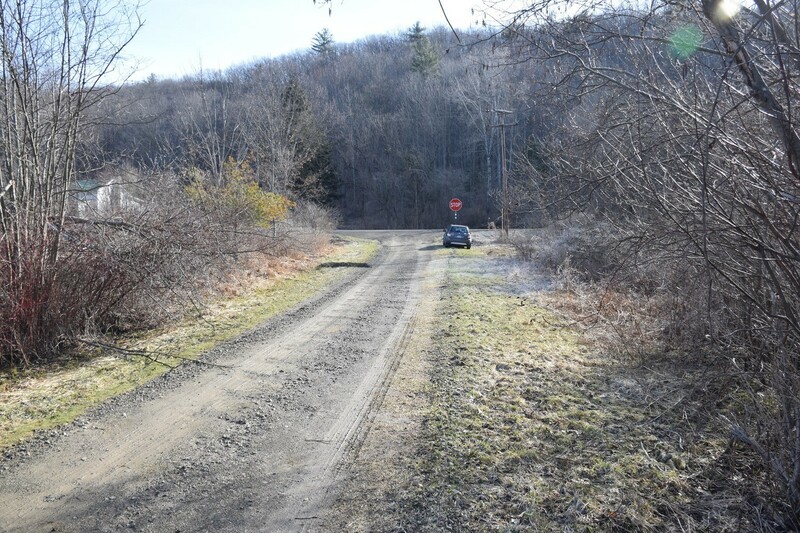 I turned right onto the road and then left onto Dalton-Birdsall Road to begin the long climb up. Thankfully it was cool out, only around 51, because the climb was long and I was getting warm from the exertion. I trudged up the hill to the junction with Fox Hill Road and continued on up. Finally after nearly a mile and almost 400 feet of climb the road began to level out. I came to the sharp turn on Fox Hill Road and stopped to take some pictures of the view. 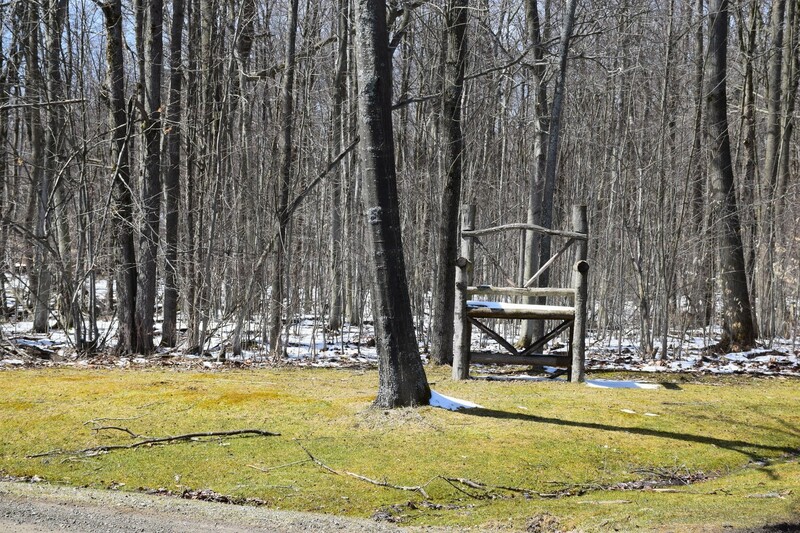 A short distance down the road I came to the house with the large chair (mile 15.1 – 4:07 pm). I left the road and turned onto the trail picking my way down the old field and into the woods. Not long after I arrived back at the hunting cabins and decided to stop for a rest break at the picnic table. After a break I set out again heading toward the stream and gully crossing part of the trail. I had started counting on my way back and I was up to three so far. I knew there were many more ahead of me. 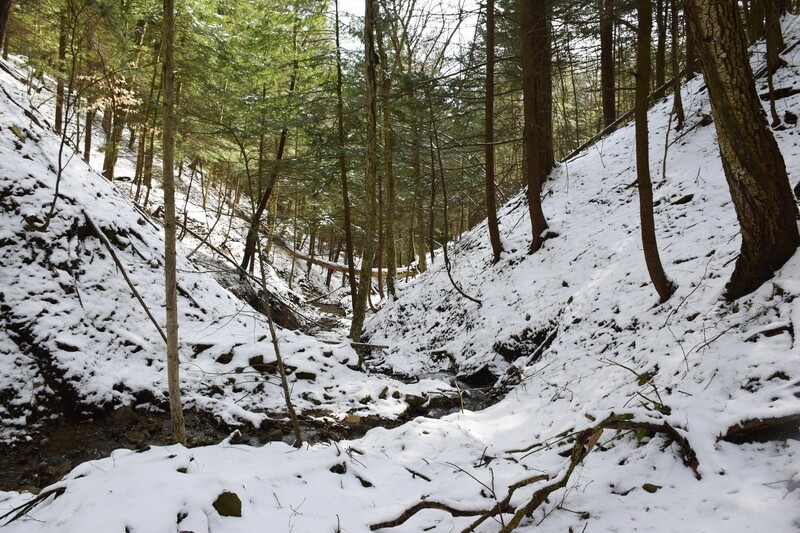 The snow that had layered the ground around many of the gullies was gone now. A few small patches remained in some deeply shaded areas. I continued to count the crossings and by the time I was at the deep gully I was up to twelve. Finally I started down the steep descent to the back of the farm. The trail was muddy and sloppy in places and I sunk into the muck and slid. As I neared the back of the barn I heard the low rumble of a large engine, it sounded like a train. 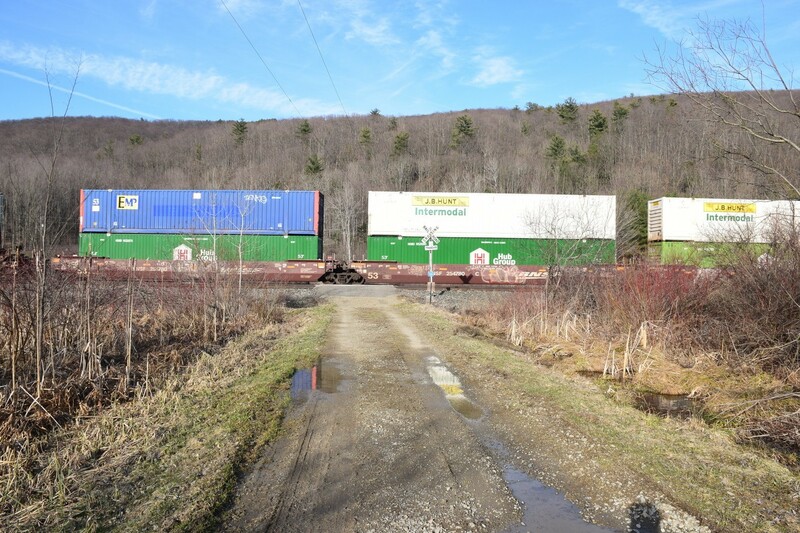 As I came around the barn I saw a train barreling down the tracks. My first thought was “you’ve got to be kidding me! I’m tired and sore and just want to get to my car and now I have to wait for a train!”. I continued on heading for the crossing, there was nothing else I could do. Thankfully before I reached the crossing the train cleared and I was able to continue on the last few yards to my car without stopping. Finally I was back at my car and I could take my boots off and change my shirt (mile 19.31 – 6:05 pm). My feet had gotten wet from slopping through the streams and the mud and muck. I was happy to remove my boots and wet socks. My final count of streams and gullies was 17. Fourteen of them were in the first four miles of the hike. As I was changing a man came across RT 70 from a house on the other side. He thanked me for parking on the shoulder of Kennedy Road rather than on the side of RT 70. The road and land on this side of the railroad tracks was his. Accidents had happened when people parked on the narrow shoulder of RT 70 because trucks would move over across the yellow line to give room and hit oncoming traffic. He said that he would call the FLT office to let them know. I thanked him for the information and for allowing the trail to go across his property. He headed back to his house and I got into my car and started the long drive home.